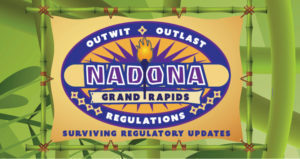 June 24-27, Lisa Thomson, Sue LaGrange and Donna Webb are joining other health care professionals at NADONA’s 31stNational Conference in Grand Rapids, MI to celebrate Nurse Leader membership achievements, enhance networking opportunities and offer insight through various presentations. This year’s theme, “Outwit…Outlast…Surviving Regulatory Updates,” details the need for industry leaders to learn the new regulations and how to best adapt to these changes in your organization. “Track One: Clinical Readiness, Capacity and Competency in the New Value-Based Payment Models – Not an Option But an Expectation,” from 2:00 p.m. – 3:30 p.m. on June 24. “Late Breaking Preparing for Emergency Planning Requirements – I Can Do It,” from 3:45 p.m. – 5:00 p.m. on June 26. “Action Centered Plan for the DON. It’s About Surviving,” from 6:15 p.m. – 8:00 p.m. on June 24 with Robin Storey and Cynthia Fronning. “Hot Topics Roundtable In Post-Acute Care and Long-Term Care: You Can Win! It’s About Surviving,” from 6:00 p.m. – 8:00 p.m. on June 25 with Robin Storey and Cynthia Fronning. “Just Stand Up! : Creating Engaging Meetings that Work,” from 8:00 a.m. – 9:00 a.m. on June 27. Monday, June 25 from 1:00 p.m. – 3:30 p.m.
Tuesday, June 26 from 1:00 p.m. – 3:30 p.m.